One of our major shows of the year was for La Salle Academy! They are a group of highly energetic and very polite student body that wanted nothing more than to have a great time and party. The event was held at the Hyatt Regency on Goat Island in Newport which sports incredible views of the ocean bay. The facility served a full course dinner to over 480 students that were in attendance. La Salle Academy's senior prom pulled out all the stops to provide a completely immersive experience in both audio and video media! 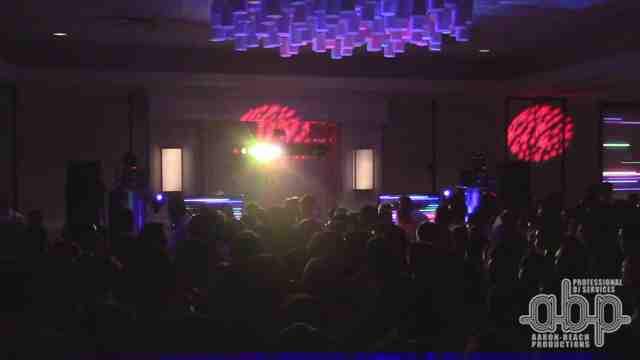 We provided full DJ services and also a full multi-media package. We brought out our large audio system to ensure we had plenty of volume and superior sound. For video, we brought out our 2 10' x 10' rear projection screens and 2 mobile 46" portable LCD motorized lift screens. We had entrance text on the screens that displayed a warm welcome message to all the students as they entered the room and other areas of the night like the king/queen crowning, dinner, and as they exited for the evening. The students created their own senior video that was presented just after dessert was served. They did an excellent job on the video editing and it played flawlessly while the entire student body was thoroughly entertained. The video in its full unedited version is available below. We also added an extra feature which included two PTZ cameras to provide live video feeds of the student dancing and having a great time displayed randomly on any of the 4 screens that were rotated by a custom HDMI matrix switching controller! We also provided a wide variety of video FX that was placed on the screens while audio was running. With over 256 combinations of video projection switching, we were able to keep the videos and live cameras in multiple states of suspense as the night went on. The students loved the live cameras and it showed as they were all pointing and dancing while they watch on the screens in real time! The night was flawless and we enjoyed every minute of the time that we had them dancing and jumping up and down to all their favorite hits! Congratulations to the class of 2015 and we wish you all the best in the next stage of your lives and thank you for letting us be a part of it!